Croatian World Games - Zadar 2010. Interview with Franjo Pavic. » Home » Sports » Croatian World Games - Zadar 2010. Interview with Franjo Pavic. » Home » Community » Croatian World Games - Zadar 2010. Interview with Franjo Pavic. Franjo Pavic, Sasa Plevnik, Bastijan Matulic, I.M., Petar Cosic, Silvija Sagolj, Erwin Lucic, Marijana Sagolj & Danijel Lucic. The interview with Franjo Pavic, head of the organisation committee for Germany and coordinator for Europe was conducted by Marijana Sagolj, who is one of the main Administrators of the Xing Group “Croatian Diaspora Community”. Preface: The second “Croatian World Games”, also known as “Crolympia”, will be held in Zadar in July, 2010, and organized by the “Croatian World Congress”, the main association of expatriate Croatians in the world. So athletes and other participants at the Games will not only come from Croatia, but from more than thirty countries. We talked about these Games with the head of the organisation committee for Germany, Mr. Franjo Pavic, who is preparing this unique cultural and sporting event with a team of young volunteers and other members of the “Croatian World Congress”. CDC: How was the idea born to arrange the “Croatian World Games”? Mr. Pavic: At the end of the year 2001, some members of the “Croatian World Congress” discussed for the first time in Switzerland about the idea to arrange such games. The idea found more and more supporters, and was then proposed at an annual convention of the “Croatian World Congress” in Zagreb. 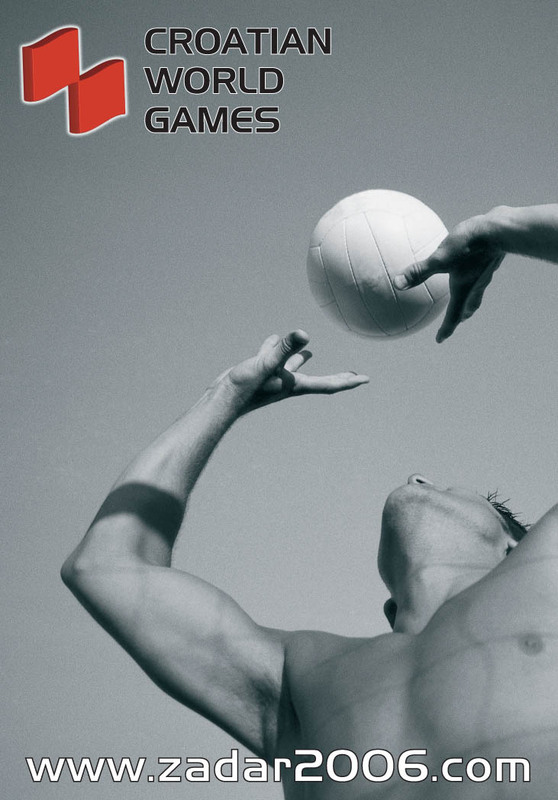 As you know, the first games were held in 2006 in Zadar, and they were a big success. We also released a DVD about of this fantastic sporting event..
CDC: How was the response to the first games in 2006? Mr. Pavic: We could really be satisfied with the response that these first games had received. 750 participants came from 22 countries. The competitions took a whole week, and people were celebrating 24 hours per day in the tourist villages which were part of the festival. The hosts arranged a fantastic cultural entertainment with Dalmatian songs every night. Grilled fish was available, and people went sightseeing in the villages around our beautiful Zadar. We didn’t want that party ever to come to an end. But after seven wonderful, unforgettable days we had to leave. We parted with the promise to continue that party at some other time on an even larger scale. CDC: Did you discuss your idea to repeat the Games in 2010 with the City of Zadar? I don't see why they should not support us again. It will be a good chance to strengthen our connections. CDC: What response do you expect for these second games in 2010? Mr. Pavic: I am confident that more than one thousand people from all over the world and from all continents will participate. The question is not how many people would participate, but how many people the venue will be able to host. All these people will have to be accommodated somewhere. In addition to the athletes nearly 4000 people will come, their family members and friends, and we will have to find some form of private accomodation. CDC: How will the “Croatian World Congress” finance such a big project? Mr. Pavic: Primarily and mainly with voluntary work done by the supporters within the “Croatian World Congress”. The Organisation committee - of which I am the head in Germany - is trying to find sponsors in the business world. In addition, we will try get some funding for cultural and youth projects, which are also part of our Games. Of course we are counting on the same sponsors as for our first games. The government of the Republic of Croatia, City of Zagreb, County of Zadar, national Olympic committee of Croatia, Croatian Heritage Foundation (Hrvatska Matica Iseljenika) and other institutions. Any additional sponsor will be most welcome. CDC: How can interested people get more detailed information about the Games? Mr. Pavic: From March 2009, detailed informaton will be available from our website, with the official announcement, contests, accommodation, tournament rules and so on. Before this launch of our website, you may contact the organisation committee by email. My main address is: Franjo.pavic@gmail.com. CDC: Can you tell us more about the “Croatian World Congress”, how was it established and what kind of an organisation is it? CDC: What are the aims of the “Croatian World Congress”? Mr. Pavic: The aims of the congress are to maintain and promote Croatian culture, to preserve our spirit and heritage, to help to rebuild our homeland, to connect Croatian expatriates throughout the world with homeland Croatia, and to organize cultural, business and sporting events like the “Croatian World Games”. CDC: When did you become a member of the “Croatian World Congress”? What is your role in the organisation? Mr. Pavic: I have been an active member since 2004, and at the global level I was elected as business leader - my present function. CDC: In which major projects did you participate, and which projects are now in the planning process? Mr. Pavic: I have worked on the following projects: building a memorial centre in Bleiburg (Austria), release of historical publications like “Croatians, 14 centuries in history”, building of a “centre to connect young people” in the county of “Zeravac” in the “Bosanska Posavina”. In 2006, I became the successor of the director of the Croatian World Games, and so I was involved in the organisation of this wonderful event and in other humanitarian projects. The future is full of challenges. Our biggest project is the “Croatian World Games 2010”. Apart from that, we continue to provide humanitarian help to Croatian people in Bosnia and Herzegovina, we continue to help children in the homeland, we are systematically building a network between Croats in Germany, and we will organize scientific and business symposiums, one of them at the end of April 2009 on “Croatia and the European Union”. CDC: Who are the main members of the “Croatian World Congress”? Mr. Pavic: The membership of the “Croatian World Congress” includes cultural and sport organisations, businesspeople from different branches, personalities from public life, web portals, catholic missions and other organisations. HSK is the one and only Croatian charity organisation in the world that can function s an umbrella organisation. All our volunteers arrange their work in their own way. We take pride in serving Croatia and the Croatian people. We would like to encourage all people who are dedicated and committed to that cause to join us. Voluntary work is a form of finding fulfilment on a long-term basis. CDC: Thank you for this interview. We wish the “Croatian World Congress” the greatest possible success in organizing the “Croatian World Games” in the year 2010. (E) Zadar 2006 Invitation to all Croatian athletes around the world! za Hrvatske Njemce do sada na facebooku nije otvorena grupa, pa to s ovim najavljujem, da æu za domenu www.zadar2010.org i njihovu koordinaciju svega ¹to je na njemaèkom pod imenom: "ZADAR 2010 - HRVATSKE SVJETSKE IGRE - CROATIAN WORLD GAMES" usredotoèiti.